In general, it is very easy to look at people around us and draw conclusions about large groups. I believe this phenomenon is reflected in people who are practicing ophthalmology or were trained in ophthalmology. Certainly my experience with female ophthalmologists exemplifies this phenomenon. At the risk of dating myself, I will share that I completed my fellowship in Pediatric Ophthalmology and Strabismus in 1983. I had the privilege to know one woman who was an ophthalmologist during my residency. At the time I started my residency, there were two other women. At the annual AAO meeting, it was very easy to use the ladies room because only about 17% of ophthalmologists were women. Fast-forward to 2014; many members of women in ophthalmology (WIO) believe that we’ve made enormous gains as women in our profession. I am not here to refute that since it is true in so many ways. Many of you have had the opportunity however to attend national ophthalmology meetings and experience the paucity of women on the podium of such meetings. We can all observe how many Chairs of Ophthalmology Departments are women. According to the AAO, 22% of members in 2014 were women. 5% increase in 30 years. Here is some further information about where we stand. 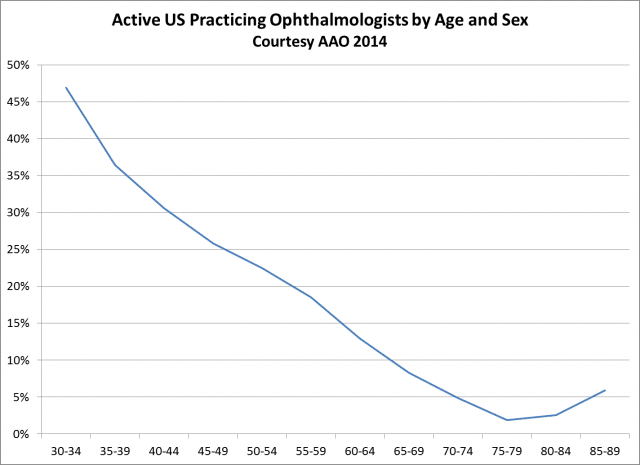 Women are increasing as a percent of ophthalmologists for our younger colleagues. In fact in 2014, 44% of residents were women. When female residents look around, they see a lot of people that look just like themselves. But remember, those are not the people writing letters of recommendation nor those who are hiring or promoting. Some specialties in ophthalmology seemed to reflect the overall composition of the group, notably comprehensive ophthalmology. However, cataract and IOL (13%), retina/ vitreous surgery (14%), and refractive surgery (8%) are comprised of significantly less than the average of 22%. The graph shows what the AAO data reflect on self-identification of specially. These are the most numerous 10 specialties identified. 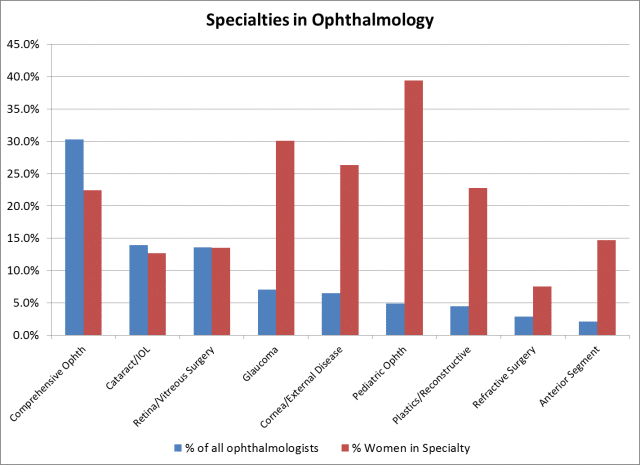 Certain specialties reflect a significantly higher percentage of women as members – glaucoma, cornea/external disease, pediatric ophthalmology, and plastics/reconstructive medicine. What does this say about ourselves? 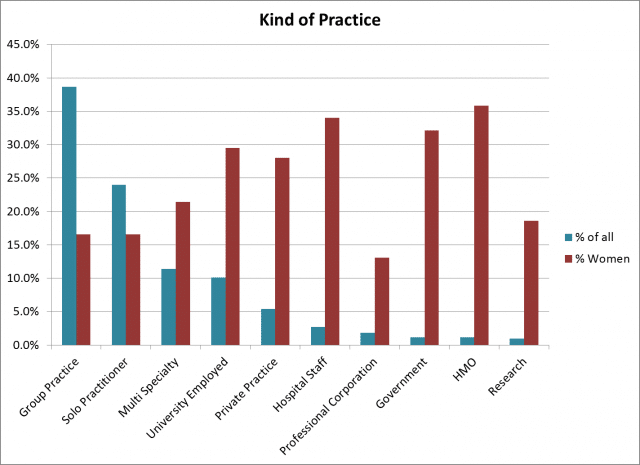 Finally, take a look at the distribution of women in different practice types. It appears that women have segregated themselves away from self-employed roles, and to those in which they are employed. Just musing about what this says to our daughters. Personally I never felt as free, and burdened at the same time, as when I owned my own practice. I would love to have a dialogue about this among our members and other ophthalmologists both male and female. And I promise to have that discussion with my granddaughters and younger colleagues. I want to express my sincere thanks to Ruth Williams and David Parke of AAO for sharing this raw data with Women in Ophthalmology. The better we understand ourselves, the more we can change intentionally, rather than at random.